Since learning about Pro Wrestling Tee's Micro Brawlers, I've wanted to start collecting them. The company has a pretty good deal on inactive figures. I paid $18 for three of them. They were mystery brawlers and in this week's episode, I open them up sight unseen. 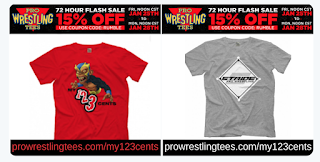 Pick up some Micro Brawlers and a Mondo shirt at Pro Wrestling Tees. Click the link below to shop. Who will win the Ultimate Royal Rumble? VIDEO: Go Figure Friday: FIVE!